Build your foundation of clinical skills by completing these 10 fantastic & interactive online courses, with 25 hours of exciting education, videos, interviews, and valuable resources. In the Clinic: Building Blocks courses are the pre-requisite for Take the Wheel. Prepare for the car by completing these exciting online courses including over 15 hours of advanced education focused on driving & then put all you have learned to practice, in this one of a kind, 3-day workshop with 20 hours of training with a certified driver rehab specialist. Rather than being locked into attending a conference or enrolling for the semester, we offer dynamic online, on-demand learning and our Take the Wheel Workshops are offered over 3 days, several times throughout the year! These dynamic, interactive courses, are for the OT practitioner preparing to expand into the field of driving rehabilitation. Part 1 In the Clinic: Building Blocks builds a strong foundation by providing the OT with a range of assessment tools and interventions to prepare the client for the car. Part 2 In the Car: Take the Wheel includes online preparation courses and 3 days of live, hands-on training, with experienced occupational therapy driver rehabilitation specialists, in a driving rehabilitation vehicle. These courses are a must for any occupational therapy practitioner preparing to participate in the field of driver rehabilitation. All Building Blocks Courses available immediately. Take the Wheel online courses available starting May 20, 2019. Enroll now to reserve your spot at the live workshop and pace your online learning. Take the Wheel is a unique learning experience! "Adaptive Mobility was fantastic! I am newer to driving rehab and had the opportunity to learn from Susie this week ... Her patience and skills in teaching us how to advance our own practice was unmatched in my experience. What a wonderful opportunity for learning. I encourage any OT to consider learning from Susie how you can further your own skills to work with clients in the field of driving rehab. Thank you Adaptive Mobility Services!" Earn valuable continuing education credits while you benefit from this one of a kind learning experience! These courses are ideal for any occupational therapy practitioner preparing to enter the field of driving rehabilitation. Part 1 In the Clinic: Building Blocks Bundle includes the 10 foundation online courses for a total of 2.5 CEU or 25 contact hours. These courses are the prerequisite for Part 2. Please visit the In the Clinic: Building Blocks pages for full course details. Part 2 In the Car: Take the Wheel includes the 7 online courses & 3 days of live workshop for a total of 3.5 CEU or 35 contact hours. All online courses must be completed prior to participation in the live workshop. Visits the Take the Wheel page for full course details. Live workshop space is limited to 4 participants to ensure optimal learning and to maximize your hands-on time in the vehicle. Visit the Take the Wheel sales page for full details. Workshops are offered in Orwigsburg, Pennsylvania, a small suburb outside of Harrisburg. This setting offers a range of ideal driving environments, so participants can be introduced to concepts on quiet roads & then progressed into more complex driving environments. Major airports include Harrisburg, Allentown, & Philadelphia. Hotel accommodations in Hamburg, Reading, & Pottsville. Shared rides & public transportation are limited. A rental car is recommended. If you wish to meet the other attendees prior to the course, to coordinate travel, please reach out to us! Interested in hosting your own Part 2: Take the Wheel Workshop in your geography? 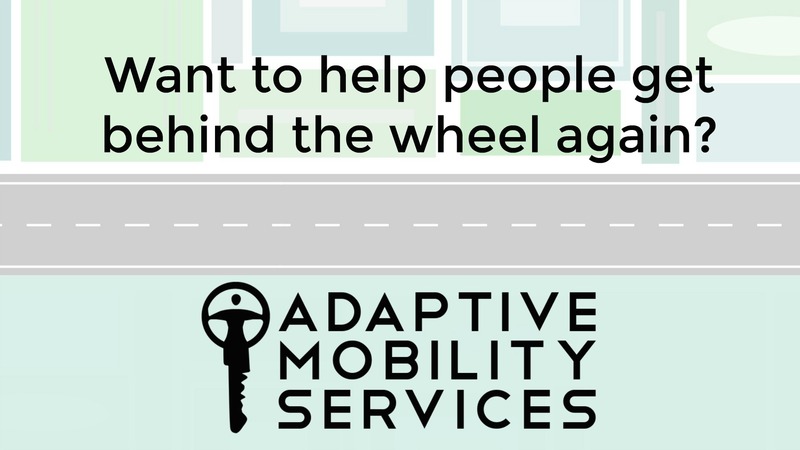 Reach out to susie@adaptivemobility.com for additional details. Course Completion Requirements: Learner will complete all online coursework prior to attending live workshop, will participate in full workshop, & complete AOTA APP Provider Survey to receive continuing education credit. Partial credit for workshop will not be awarded. Wondering if this Bundle is Right for You? Looking to address driving risk & readiness from your OT clinic? This set of courses is the perfect foundation for you! Purchase these 10 courses together and save! Have you already taken Part 1 In the Clinic: Building Blocks (or another introduction to driver rehab) & now you are ready to progress to Part 2 In the Car: Take the Wheel? Then this course is for you! Ready to save big & learn it all? Take advantage of Part 1 & 2: Building Blocks & Take the Wheel Build Bundle to learn everything you need to get started! Next upcoming workshop July 17-19, 2019. Enroll Now to reserve your spot! Spots are limited to 4 students per workshop. Use Coupon Code AOTA2019 at checkout to purchase this bundle for $3499.00! Coupon Valid thru 8/31/2019. Cancellation, Refund, & Disclaimer: Please visit the main page for full details. June 19-20, 2019 Take the Wheel in Pennsylvania is SOLD OUT.